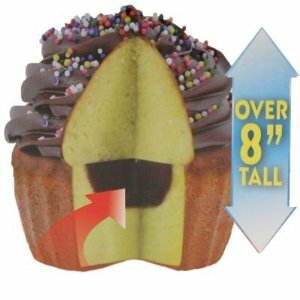 Handy Gourmet Magic Giant Cupcake Maker only $7.99 w/ Free Shipping! Right now at Amazon, you can score a Handy Gourmet Magic Cup Cake Maker for only $7.99 with free shipping! With it, you’ll be able to make giant, 8″ high cupcakes! There are only 5 reviews, but all of them are good ones. NOTE: To get this price, look on the right side of the product page and buy from the seller "DealGenius". It includes a special mold that allows you to fill the center with pudding, ice cream, whipped cream, fresh mousse, and more.